We birders north of Mexico used to have a parrot to call our own, a sun-faced, spike tailed jewel called the Carolina Parakeet that traversed the southeastern United States preceded by the adrenaline inducing ear piercing squeals that haunt the fever dreams of any birder lucky enough to have made the journey to the Neotropics. It was reportedly unforgettable, but then again most members of the celebrated psitticine family are unforgettable, though these days it probably has more to do with their dominance in western cultural traditions as primary avian cracker-wanter and pirate accessory. Often, they tend to stand in for every other species of bird when something immediately tropical is required, which leads to their unfortunate pairing with palm-tree heavy island waterfall motifs despite that fact that many species, including our proudly temperate and defiantly extinct former parrot, do not count Caribbean resorts as primary habitat. Still there is a place missing in our North American ornithological entourage that can only be filled with something hook-billed and squawky, and it’s perhaps fortunate that so many psitticines have more or less eagerly jumped into the fray as a replacement for their lost brethren, though none have nailed it completely. Monk Parakeets, of course, have managed a beakhold in several cities across the continent, and Florida mantains a menagerie of Psitticids though it’s sort of unclear how many of them are self-sustaining and how many are sustained only by a constant seeding of escaped cage birds and smuggler’s losses. 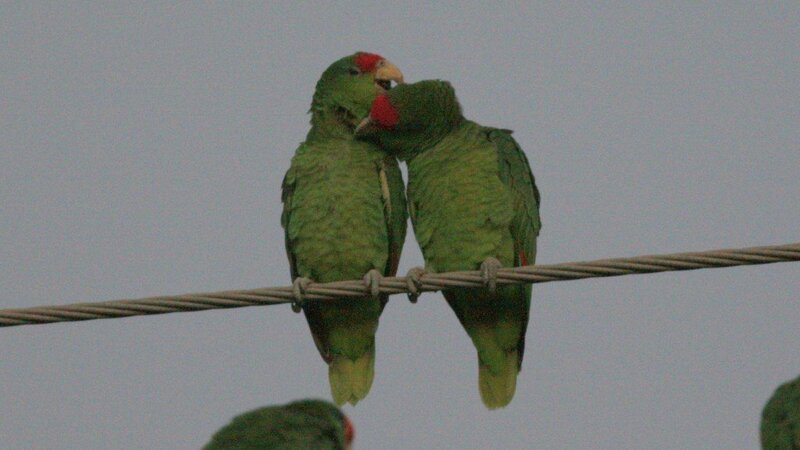 I suppose that’s the question posed of the parrots of Texas’s Lower Rio Grande Valley, too. 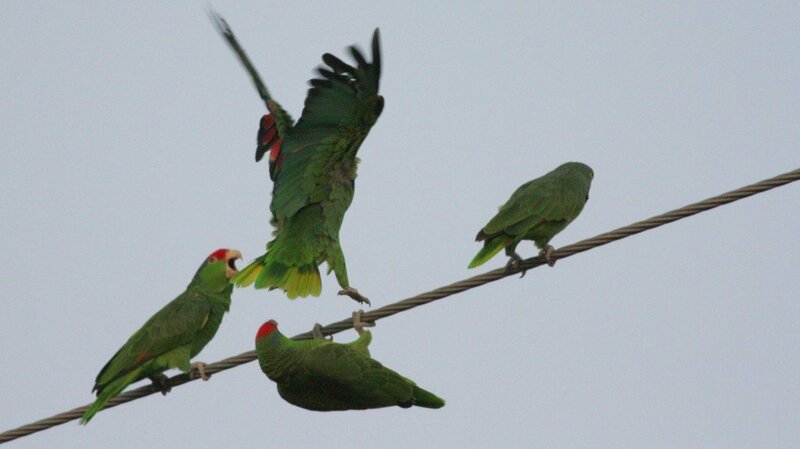 The thriving populations of Green Parakeets and the fantastically flashy Red-crowned Parrots are just as likely to be escaped cage birds made good as they are to be legitimate strays seeking asylum from habitat degradation in nearby Tamaulipas, Mexico. There are undoubtedly both in there somewhere, but there’s no way to tell for sure, and the parrots, for all their celebrated conversational ability, certainly aren’t talking. As it is, the American Birding Association considers these birds to be officially countable, which is good enough to attract droves of birders to the special parrot trips offered by the Rio Grande Valley Birding Festival to seek them out. Thing is, with a little bit of prior knowledge and patience, the birds are pretty easy to find on their own. They are, after all, crow-sized, incredibly loud, and screaming green. 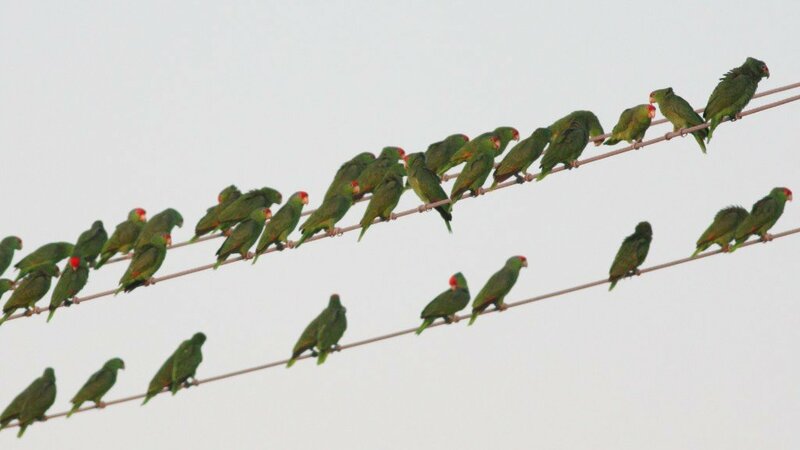 They arrive en masse in a whirling tornado of color and sound, these parrots, and they perch on power lines in seemingly unremarkable neighborhoods in towns across the Valley where you are at once insanely jealous and incredibly sorry for the non-birders who’ve made their homes here. Because they are loud. In a way that’s sort of a nails across a chalkboard with the intensity and constancy of a jackhammer. And they don’t interact in the way that most birds do, arriving with a burst of noise that settles to a low murmur. Theirs is a constant cacophony, unrelenting. It’s nothing short of invigorating for the birder -a parrot screech blasts the wax out of your ears and drives a wave of sound that is positively neotropical directly into the pleasure centers of your birder brain – but for those weary people returning home from a long day’s work to this? I sympathize. I do. The flocks are mostly Red-crowns, but closer inspection reveals other Amazona parrots of almost certainly questionable origin. A pair of Yellow-headeds hid in an ornamental tree in the backyard, but most of the not-red-crowns are the similar Red-lored Parrots, characterized by their yellow faces and dark bills. To make matters worse, even closer inspection will reveal intermediate birds with patches of yellows and reds willy-nilly on their heads. Though their ranges don’t overlap in the Neotropics, they seem to have no problem engaging in miscegenation while on the lam. And why not? These birds have no trouble showing affection. The bonded pairs in these flocks are obvious, and though they may spend the entire day foraging in separate flocks, upon their return to the roost site, the bill touching and preening must begin. It’s an elaborate ritual, and gets to the point where it can get a little uncomfortable for those of us watching so intently below, cameras clicking until it’s so dark the only photos you can get are grainy and dim. We’re fortunate to have them, of course. Despite their unclear provenance, it’s nice to have parrots, wild free-flying parrots, north of the Rio Grande. They’re a poor replacement for the one we’ve lost, but, as my mother used to tell me, beggers can’t be choosers. The fact that they’re parrots – wonderful, raucous, impossibly green parrots – is good enough. 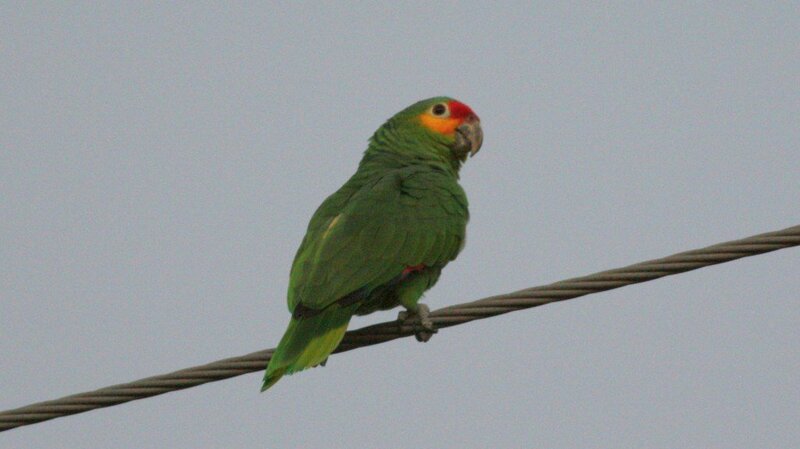 Very informative post…Ive not seen the Texas parrot flocks. Do the Green Parakeet flocks have other species mixed in as well? It’s been some time since I saw the Green Parakeets (I didn’t see them this time), but my understanding is that those groups are pretty monotypic. In that, I haven’t heard of any additional species being found in them. I love your writing Nate! Oh, and good photos too. We had the pleasure of seeing these wonderful birds while in Texas earlier in the month. It was an experience I will soon not forget!! Eloquent as ever, Nate. You really nailed the experience of encountering the RGV parrots, particularly regarding the locale! Really nice post 🙂 Great timing because rose ringed parrots have started visiting my neighbourhood (which is is a close cluster of short buildings) because someone planted a pipal tree between the building i live in and the next. Early in the morning, I am greeted by their screeching. I make my tea, they have their breakfast — berries from the pipal tree. Off late, 3 of them come and pick off the fruit opposite my kitchen window, giving me a clean view of their antics. From childhood, I have always loved their acrobatics on slanting wires, bend-y branches. Sometimes I feel they know we are looking and they do an extra little twirl around a twig to get at a berry on a lower level. Love it. Truly beautiful post, Nate. Worthy of its subject. I live in Phoenix AZ and we have a large group of peach faced lovebirds in my neighborhood. I have counted up to 30 in a neighboring tree where they gather in the late afternoon early evening. Have seen 10 or more in the bird feeder in my yard. Noisy when flying or wanting fed but do quiet down. Just like to share my exsperiance, I was at a river swimming with a group of friends back in june 2011. We were sitting on the bank when I noticed a bird green, yellow and redish Orange. Flew by several times and some of my friends were noticing. I’ve been familiar with this bird and sure of what I saw. I will keep returning to the location to learn more about the area.